Welcome to the AKC Breeder E-Z Reg! 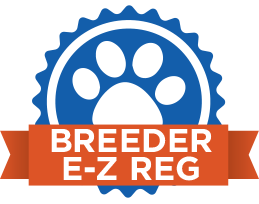 An online alternative to the Full Litter Offspring Plus application, Breeder E-Z Reg gives breeders an efficient and effective method of registering all of the puppies in their litters. New to Breeder E-Z Reg? Click here to watch a video tutorial on how to use Breeder E-Z Reg. If you would like a more in depth look at the benefits and common questions about Breeder E-Z reg click here to watch the "AKC Breeder E-Z Reg" Webinar. Register Your Litter: Registering your litter is the first step to getting started with Breeder E-Z Reg. If you have not already registered your litter, you may do so online or by paper form. Breeder Payment Application: Is your litter already registered? Click here to go to the Breeder E-Z Reg Payment Page to prepay for all of the puppy registrations in your litter. Puppy Management Application: If you're ready to update your puppy's information, click here for Breeder E-Z Reg Puppy Management. You can update all of the dogs or just one at a time. The choice is up to you. Complete Your Dog Registration: If your puppy buyers are ready to complete their pre-paid dog registration, click here.